CITY OF INDUSTRY, Calif., May 21, 2018 /PRNewswire/ -- Soleus Air, following its innovative path, is launching its new patented Air Circulator & Fan line. This new line delivers the most cutting-edge technology while maintaining a stylish and sophisticated design that will give a touch of contemporary décor to your home. Designed by a professional team, this series will be a perfect addition for your home, bedroom, office, or college dorm. Compact, silent, and neutral colors are just some of the features that differentiate these lightweight circulators as a statement piece for any room, while being extremely functional. 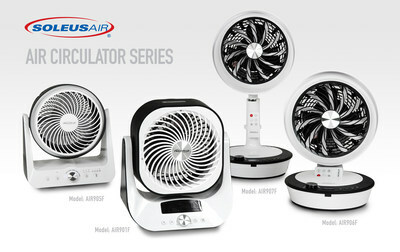 This new line provides a well-balanced, powerful, & dynamic flow of air that is ultra-quiet, taking comfort to the next level, while reaching up to 25 ft. Four different models varying in size, each offers an assortment of different features: 6 to 12 speed settings, pre-set wind mode, remote control, auto-off timer, 90° vertical tilt; and, unlike standard air circulators, most have an automatic 60° circular range of motion. One particular model is a portable circulator, which is charged via USB: great for beach days, camping, or any outing. Soleus Air New line of Air circulators generated great interest at the 2018 Int'l Home + Houseware Show in Chicago, IL, 2018 National Hardware Show in Las Vegas, and 2018 Living Design Fair in Seoul, South Korea.